Cook spaghetti to al dente as directed on package; drain. Return to pan. Meanwhile, in 10-inch skillet, heat olive oil over medium heat. Add spinach; cook about 3 minutes or until wilted; set aside. 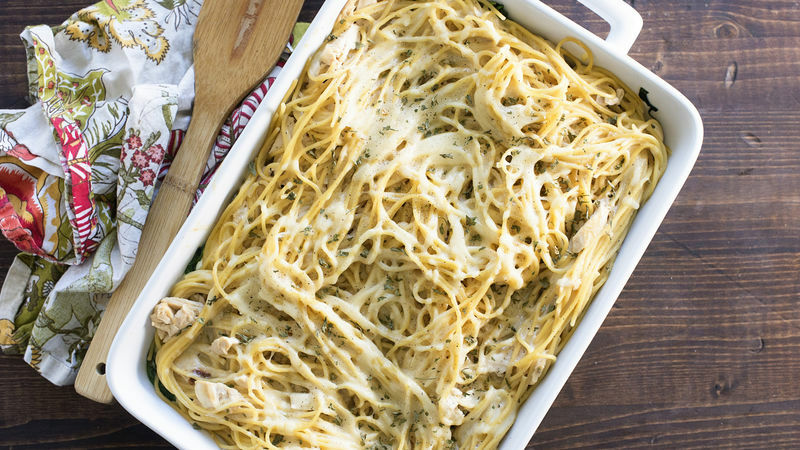 Add chicken and Alfredo sauce to spaghetti; toss to coat. Spread half of the mixture in baking dish. In medium bowl, stir ricotta cheese, 1 cup of the mozzarella cheese, the egg, garlic, salt and pepper; stir well to combine. Spread cheese mixture over spaghetti mixture in baking dish. Top with wilted spinach. Top with remaining spaghetti; sprinkle with remaining 1/2 cup mozzarella cheese. Skip cooking the spinach, and swap in thawed frozen spinach instead.